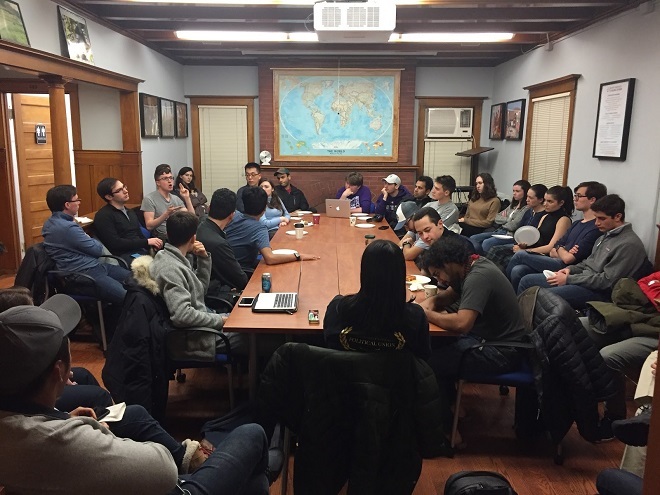 On Monday night, Northwestern’s Political Union hosted a debate addressing the current U.S. government shutdown. The resolution read: “Government shutdowns are bad for democracy.” Students traded arguments as the ongoing federal shutdown approached its twenty-fifth day, making it the longest in American history. The conflict hinges on negotiations over funding a border wall, or barrier, on America’s southern border with Mexico. President Trump is calling for $5.7 billion dollars for the project, mostly to build new sections of barrier in Texas and Arizona. He seeks to combat the illegal immigration that he, and many Americans, view as causing a national crisis. Democratic lawmakers, however, stand in firm opposition to the president, refusing to direct any funds toward a border wall they see as unnecessary, costly, and immoral. House Speaker Nancy Pelosi leads the opposition. Pelosi recently rebuked the president in a press conference, calling him petulant and obstinate in his refusal to negotiate. Hostilities have grown over recent weeks between the president and House Democrats with each side publicly blaming the other and president Trump walking out of a meeting intended to further negotiations to end the shutdown. The president has simultaneously embraced the shutdown as a price he is willing to pay for border security, while also blaming Congressional Democrats for the impasse. Hyper-partisanship has surely played a role during this time of gridlock. Senate Republicans now will not vote on a funding package that they previously approved, which contained no money for a border wall; House Democrats, including minority leader Chuck Schumer, have previously supported funding an expansion of border fencing. According to Northwestern junior Dylan Saks, who attended the debate and studies political science, the inability to compromise in recent weeks “is a consequence of everything in our society being polarized” and politicians needing to appease their “fired-up” bases. Despite the shutdown’s political nature, it still has very real consequences for many Americans. Departments such as Housing and Urban Development, Agriculture, and Interior have no current funding. This has meant limited routine FDA inspections, cutting off funding for Native American services, and drying up farming subsidies, among other effects. Almost 800,000 federal workers have either been furloughed or asked to work without pay, though Congress approved a bill to guarantee backpay, and many more government contractors are out of work. A group of senators from both parties convened on Monday to negotiate some sort of deal, but found it difficult given the hard commitments made by the president and House Democrats. The president also rejected a bill, proposed by Republican Senator Lindsey Graham, to open the government and postpone border security talks, while saying that he does not want to invoke a national emergency. As the shutdown continues, no easy solutions seem available, but each day of indecision has enormous consequences for millions of Americans.